Blend SA’s most elite bands with some great international acts, throw in a sprinkling of comedians, some world class electronic DJs, and bring to the boil with sound and lighting effects that are the envy of any gig. Serve to over 10 000 party goers in a sea of tents in a remote area renowned for its spring flowers and the unmistakeable result? Rocking the Daisies. For this annual event, people will happily abandon creature comforts, endure Cape Town’s precocious October weather, camp cheek-by-jowl, and risk public bathroom facilities. Rocking the Daisies is, after all, the “go-to” festival of the year. And this year, the organisers of Rocking the Daisies outdid themselves. Reputation already in place, early bird tickets were sold out within the first hour of availablity. And that was before any act was announced. Then as the months ticked by, the much-awaited internationals were announced. First up was English indie band, Alt-J. Then Swedish rock band The Hives, German electronic master Boys Noize, and possibly the reason why they sold out completely… British rock heavyweights Skunk Anansie. Last Thursday the queue outside the entrance was lining up before the gates were opened, eager campers ready to leave all inhibitions behind on the dusty single track road leading to Cloof Wine Estate. Even upon arrival, Rocking the Daisies has an unmistakable energy in the air, a distinct glow to it perhaps earned by the determined green drive behind the event. The greenest and glowiest of all were of course those who’d partaken in Walking the Daisies and Riding the Daisies, but everyone happily made the most of the recycling bins, the tree planting, the trade in prizes-for-trash. Nonetheless there was still quite a bit of litter blown around by the icy wind, and the lack of fliers or posters of the line-up was hit-and-miss: yes, it saved a load of paper and yes, there was a fantastic RTD app, but people still didn’t know what and who was where, presumably because the line-up at a multi-stage, three day event is something you refer to 1000 times. The idea was great, but the app’s crowning glory was unanimously its ability to guide festival goers to their individul cars and tents. Genius. Friday was really about enjoying our local talent. If you could, you’d split yourself up, so that you could be at all stages at once. Jaegermeister Main Stage was a constant crowd favourite, with a line up of rock acts, to hip hop. Given the choice, I would have just pitched a tent right there. And if dancing HARD was your thing, then the Red Bull Electronic was most likely your comfort zone… as well as a great place escape the cold. Each stage had its own distinct personality and theme, from the relaxed and – yes – hippy Hemp Stage, to the trance Nu World Barn, and the Mainstay Beach Bar complete with beach sand and deep-house blaring from the speakers over the dam. And those who needed to sit down and relax headed to the Lemon Tree Comedy Tent, perfect for the breakfast crowd recovering from heavy nights before. But it was Saturday we were all waiting for. For a band neither mainstream nor familiar, Alt-J surprisingly drew a large crowd of people who huddled together, soaking in this professional and talented act with its mellow and soulful sound. It was a beautiful calm before the storm, because soon after Alt-J had finished, The Hives had the crowd jumping around with a blistering, energetic performance. Then Skunk Anansie was up, and the rest of the estate emptied.This was who we had all been waiting for. Skin’s electrifying singing could probably be felt, let alone heard all the way in the sleeping town of Darling itself. Truly unforgettable. And it wasn’t even over with the imports. A quick run over to the electronic stage, and the unmistakable unibrow of Boys Noyz kept the party going. Not to mention the lighting effects. I was one firework short of proclaiming “Happy New Year!” to the world. Rocking the Daisies has once again proclaimed Cape Town’s summer festival season open. Will any of the other festivals match it? I look forward to finding out. 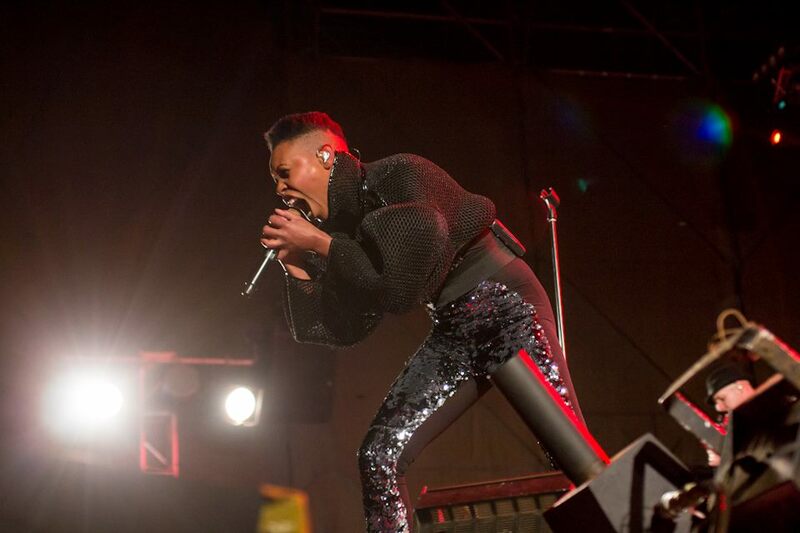 Rocking the Daisies 2013 took place at Cloof Wine Estate on 3 – 6 October 2013.